I have been wanting to get my hands on some white whole wheat flour for quite awhile now. Recently it (in the form of Gold Medal brand) has started showing up in the stores in my neck of the woods so I brought a bag home on my last shopping trip. It isn’t exactly white and comparing it to regular whole wheat it does not look that much different. However, it did seem to have a milder taste in the muffins. I decided to bake up a batch of blueberry muffins since it was the weekend and it seemed like a nice change of pace from the buttermilk waffles I usually make. Not to mention that blueberry muffins also make my husband extremely happy. I have quite a few frozen blueberries hanging out in the freezer from last summer so that is what I used. If you use frozen berries do no thaw them out or you will wind up coloring your batter a rather sickly shade of blue as you fold in the berries. Preheat oven to 400 degrees. Grease 12 standard muffin cups with cooking spray. In a large bowl whisk together the flours, baking powder, baking soda and salt. In a medium bowl, whisk together the eggs, buttermilk, light brown sugar, canola oil and vanilla extract until well combined. Make a well in the center of the dry ingredients and pour in the wet mixture. Stir just until combined. The batter will be slightly lumpy. Gently fold in the blueberries. Spoon the batter evenly into each muffin cup, filling them approximately 3/4 full. Bake for 20-25 minutes until golden brown and a wooden skewer inserted into several of the muffins comes out clean. Cool on a wire rack for 5 minutes before turning out to cool to room temperature. 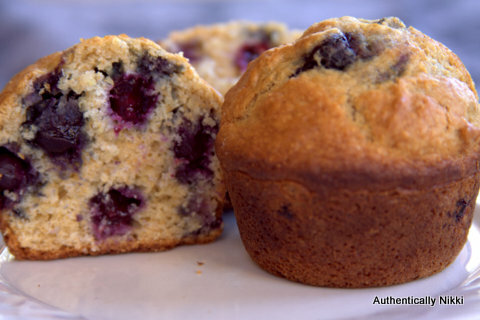 This entry was posted in Breakfast, Muffins and Quick Breads and tagged blueberries, muffins by authenticallynikki. Bookmark the permalink.